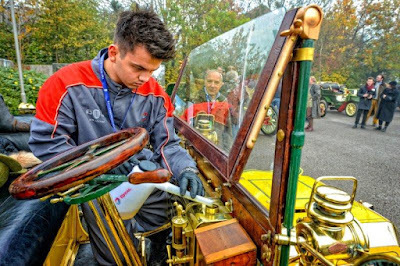 An apprentice from Classic Motor Cars helped out at the London to Brighton Veteran Car Run last weekend supplying Total oil and advice to participants. Ben Taylor, a 21-year-old apprentice at leading car restoration company Classic Motor Cars (CMC) of Bridgnorth, was on hand on Sunday 1st November at the prestigious London to Brighton Veteran Car Run to provide help and support to the vehicles involved, working with Total, one of the world’s largest integrated oil and gas companies. Appreciating that older cars – the youngest on the Run is 110 years old – are not built to quite the same fine tolerances as modern cars, Ben, who is from Astley Abbots in Shropshire, was present at both the halfway Harrods Stop at Crawley and Madeira Drive in Brighton supporting the vehicles. Whilst at the half-way stop in Crawley, Ben was called upon by a large number of people requiring oil and water top-ups, as well as general servicing advice to keep their veteran cars running. 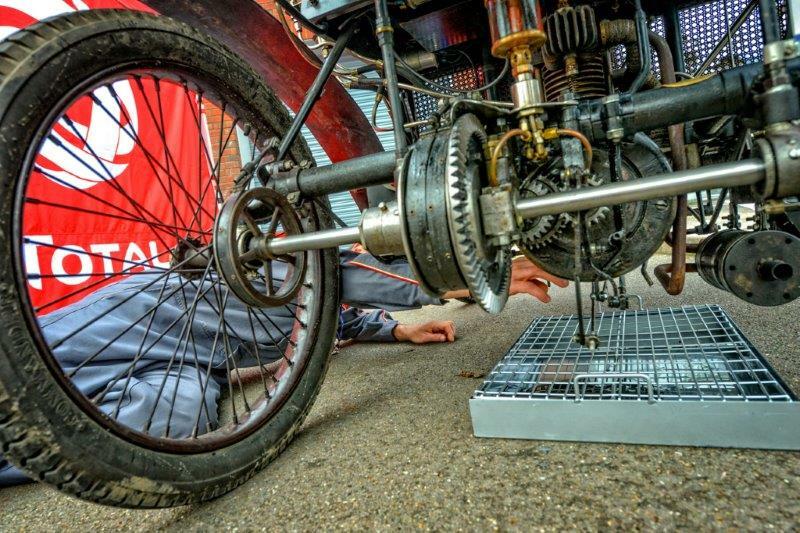 A driver of a veteran steam car had accidentally released all the pressure out of their tank, so Ben was required to refill the air using a compressor. Ben, is currently undertaking an apprenticeship at CMC in engine building, where he works on the technical side and engineering of classic cars. His work involves building full engines and cylinder heads, as well as the refurbishing of classic parts. Ben commented: “I find the technical side of classic cars interesting because they’re so different to the modern specifications of everyday vehicles. During my time at CMC, I’ve learnt to build classic engines with tighter tolerances, which reduce oil leaks, piston slaps and generally improve their efficiency”. After Ben had aided the participants at Crawley, he drove down to Madeira Drive in Brighton accompanied by CMC's Quality Control Manager Wayne Smallman from Bridgnorth, where they greeted veteran cars crossing the finish line. Here, they offered any additional post-run services to the vehicles and helped the owners push them onto the trailers. Classic Motor Cars was founded in 1993 and has over the ensuing years built an international reputation for car restoration world-class standards. Staffed by a highly experienced team of engineers and technicians, they operate from modern 40,000 sq. ft. premises and, with minimal exceptions, every aspect of a car’s restoration, servicing and even bespoke car design is carried out in-house. CMC is also the only major restoration company providing 24,000 sq. ft. of specialised storage space for classic and sports cars, right next to its prominent facilities. Some 50 to 60 cars can be found in the workshops every month including Aston Martin, Squire and Lancia, amongst others. The company also provides a Car Concierge Service, allowing owners with little time to call on a variety of coordinated services, ranging from transportation to and from UK and international events to servicing and detailing. CMC is especially proud of its apprenticeship schemes with young people learning their trades in trimming, auto electrics, bodywork, paintwork and general mechanical skills.